Eagle Pennell died a "hopeless drunk," according to a memorial article in the Austin Chronicle by his friend Louis Black. His other friends would have sadly agreed with that. He was 49 at his death, in 2002. Twenty-three years earlier, in 1979, he wrote and directed a film named "The Whole Shootin' Match" that you may never have heard of, but which had a decisive influence on American independent film. When Robert Redford saw it at the Park City Film Festival, it awoke him to the possibilities of low-budget indie filmmaking. He started the Sundance Institute, and soon after the Park City festival became the Sundance Film Festival. When Richard Linklater, then living in Eagle's hometown of Austin, saw it, he decided to become a filmmaker himself, and his "Dazed and Confused" owes a lot to Pennell. When I saw the movie at Telluride in 1980, I went for a walk on the mountainside with Eagle and mentioned that he had made a film about alcoholism. He said that had never occurred to him, though he thought I was right. His characters drink in almost every shot of the film. In the last years of his life, Black has reported, Eagle spent every dollar he could beg or borrow on booze. He lived on the streets or on the sofas of his shrinking number of friends. He made other films, one of them the very good "Last Night at the Alamo" (1983). It was not about John Wayne's Alamo but about a bar in Austin. The line on the poster read: "Some face the future head on. Tonight the boys at the Alamo face it dead drunk." Now "The Whole Shootin' Match" is getting an almost miraculous new chance at finding an audience. The few surviving prints were battered and beaten, but a good print turned up a few years ago in Germany and has been lovingly restored by Mark Rance of Mindspring Films (who will appear at the Gene Siskel Film Center, where the film begins a weeklong run tonight). Rance screened it for a few Chicago film types a few months ago in the loft of Chicago projection genius James Bond. It was like a reunion of some of those who had loved the film first time around, including Chicago underground filmmaker Tom Palazzolo and Facets founder Milos Stehlik. The print was so sparkling in crisp black and white that it played like a new film, a lovable, low-key tragicomedy about a couple of good ol' boys who live on their pipe dreams. 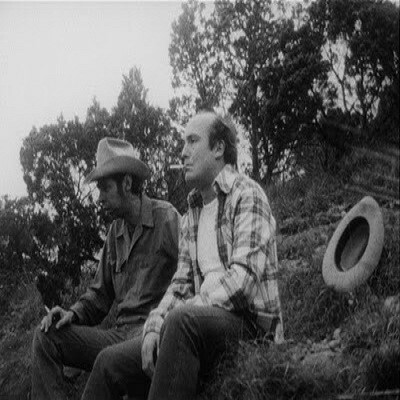 As I wrote the first time the film played at the Film Center, in 1980: "Loyd and Frank live down around Austin, Texas, where they spend most of their time drinking booze and thinking up new ways to get rich quick. By the time the movie opens, they've already lost small fortunes (very small fortunes) as frog farmers, flying squirrel ranchers and suppliers of polyurethane to rich hippies. But now they stand on the brink of a really big thing. Loyd has invented something called the Kitchen Wizard, which combines all the worst principles of a mop, a floor polisher and a vacuum cleaner, and they've sold the rights for $1,000 to a patent attorney: Gray skies are gonna clear up." That suggests the humor of the film, but not its heart. Played by Lou Perry and Sonny Davis, Loyd and Frank are goofballs, yes, but their struggle has a certain heroism, especially since they're drunk or hung over almost all of the time. If a non-drinker woke up feeling like they do every morning, he'd check himself into an emergency room. There is an undertone of unspoken, maybe unrealized, despair beneath their daily adventures. The film shows that Pennell was a born story-spinner and creater of characters. If you Google him and read the tributes and memories in the Chronicle and other Texas papers, you'll find that many Texans believe he came closer to capturing the blue-collar spirit of their state than anyone else. I know my friend Molly Ivins thought so. But Eagle could not sober up; Louis Black remembers times when he went off to rehab, got drunk on the flight home, turned up at the Chronicle to borrow money to pay for the taxi from the airport and more money for another binge. His life must have been torture. But he left behind some lovely work, and "The Whole Shootin' Match" is priceless. I rated it at three stars on its first release. What was I waiting for? Do I ever change a rating. Hell, yes. I'd give it four today, and you'll see why.